It is difficult to demonstrate body language through the posts on a blog. I have taken a series of amateur photographs to help demonstrate, which I will review with you shortly. Some people refer to these core attributes as alpha-male characteristics. Regardless of how and what they are labeled, they are the behavioral patterns of a confident man and you should internalize them. It does not matter whose techniques you use. They will not work if the attributes you communicated through subtext come across as weak. You should be aware that you are defeating yourself if you do not have the proper mechanics down. If you appear needy, nervous, or unconfident, you will dramatically cut down the chances of your success with women. Standing: Feet about shoulder-width apart. Do not stand with your feet next to each other. Arms: Never cross your arms. It’s a sign of being defensive and guarded. Keep your arms relaxed and out of your pockets. Back: Straight! Keep your back erect and chest slightly forward. Chin: Above horizon. You should not be facing down towards the ground when you walk. This is a sign of insecurity and fear. Keep your chin up! Look up! Smile: You should not hesitate to smile, laugh and have a good time. Sound simple, correct? The next time you are at a bar or social gathering, actually observe how many guys you see smiling. You won’t find too many and it’s not because they have bad teeth. When you sit, are you fidgety? Do you curl into a ball and try to fit in? Or, do you sit comfortably and take your space? Imagine that you have just enjoyed an incredible home cooked mean. You make your way yourself to the sofa to sit down and watch a highly anticipated movie. You have just eaten a great meal, you feel good, satisfied and are in the comfort of your own home in your favorite comfy sofa. How would you sit on the couch? What would be of utmost comfort? This is similar to the position you should have when sitting in a social gathering. You are comfortable, you take space, and you don’t care all that much about what others may think. This does not mean throw old ladies and children off a chair and take their place. Don’t take it to the extreme. It simply means being confident and relaxed in your environment. Do not lean in towards women. It sounds so simple, but I see so many guys doing it. I have taken a series of photos for demonstrative purposes. Some were taken in actual bars and some were taken in scenic locations for your viewing pleasure. 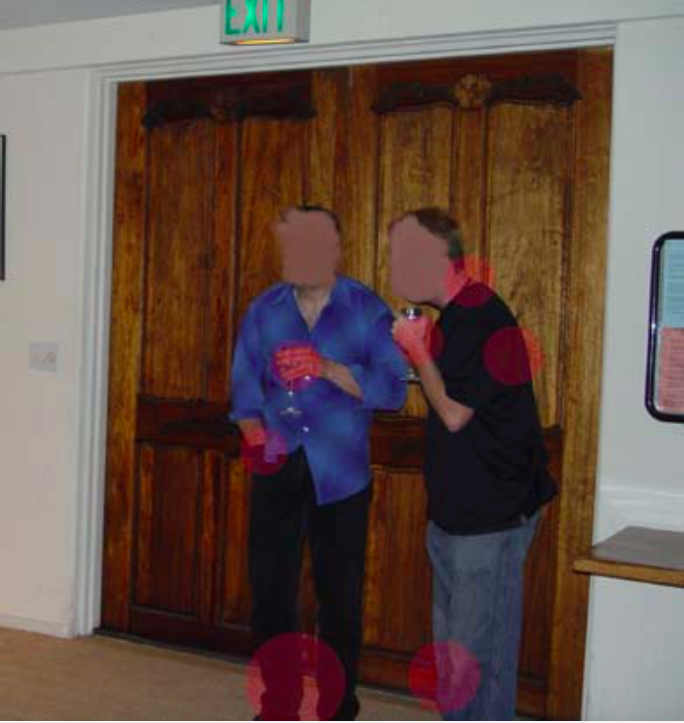 Let’s examine the photos and I’ll point out what the mistakes and the correct behavior. What is the impression you get from this photo? Remember that women are far more intuitive than men are. If you can notice uneasiness in the photo, then women are apt to pick it up 10 fold. The following is an example of a confident man leaning back. I have highlighted the hands on the male figure. 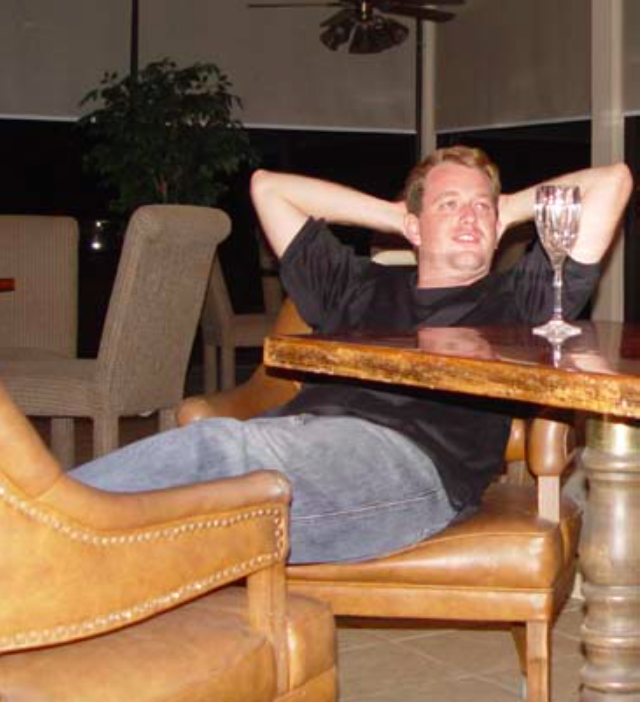 Notice the relaxed manner in which he is leaning back against the glass, holding the drink down, completely unguarded. It’s your choice as to whether you want to completely face the girl or not. You can also stand face to face if you wish. The biggest lesson in this photo: If you are able to lean back on something, do it! Again, you can observe that the man is leaning back relaxed against the glass. (This may be hard to tell in this photo.) Arms are relaxed. The woman on the right is reaching across into his space. This is an obvious indicator of interest. During the initial meet, her venture into your personal space won’t be this extreme normally. This is a demo. Also take note that that male figure has positioned himself between the two girls, and yet maintained his confident stance. If there is nothing to lean on, that’s fine. Just be sure to stand tall with your feet should-width apart. The main emphasis of this photo is the woman leaning into the man attempting to hear what he has to say in a loud environment. Anytime, a woman leans in, it is a subtle indicator of interest. If a woman is not interested in you, she will not lean to hear what you have to say. You’ll discover this very quickly. Please remember that these photos indicate cold-approach situations. The more rapport that you establish, the more you can lean in. In fact, it’d be a bit weird if you did not lean in at all later in the interaction. Upon first glance, this may look funny, but it’s a sad and common scene in bars. Let’s examine the mistakes: Feet too close together. 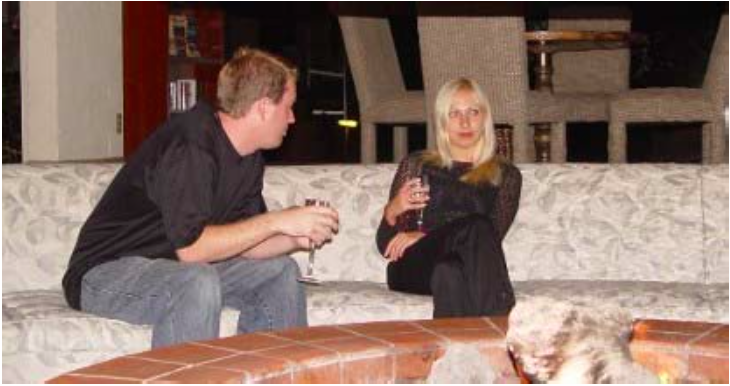 Hands in pockets, backs hunched over, drinks being held in a defensive posture, looking not relaxed, and not facing each other. Talk to your female friends regarding such men. They’ll tell you that often times they see them gawking at the women while standing near the female restroom. These men are blown out before they even approach the women. If you are at a bar with your friend, don’t stand shoulder to shoulder. FACE YOUR FRIEND, talk to him, and have a good time. If you decide to approach women, go for it, but do not stand around in a line and stare at people passing by. Take a look at the next photo. What’s your impression? This is simple the image of a man who is very comfortable. In a busy club, there may be no place to sit, let alone a place to rest your feet. Nevertheless, this photo is slightly exaggerated to show extreme comfort. The man in the photo is leaning over way too far while hunched over. He could just as easily lean back. You won’t find too many suave men going through this discomfort in order to talk to a woman. The next photo is all too common. This is an ideal and a very realistic photo! Notice the way the man is relaxed. He is attentive, but yet, completely relaxed in his own skin and his own environment. There is not even a tiny amount of neediness depicted in his body language. She feels that he is in no way desperate to pursue her. This is attractive. Why? He subcommunicates that he is a bit of challenge to the girl and she will easily sense this. Many men are often oblivious to the signs of a woman’s interest. All people subconsciously have mannerisms and actions they take when they are interested in someone. These include biting/licking of the lips, leaning in, asking questions, playing with one’s hair. (Playing with the hair won’t be this extreme. It’ll be subtle!) Some men may wonder why they have never seen these. That’s because they have never been looking for them. They are there. Again, most men are just oblivious to these indicators of interest. thanks for the post, bebe. i can clearly see the difference between confident body language and body language that turns women off. as you mentioned at the end, many guys are oblivious to the signs of a woman’s interest. that’s because when women show interest they do it in subtle ways. when a guy likes a girl, its very obvious. but women show their interest in subtle ways, so its harder to recognize/pick up on. i had never put much thought into my body language, but i’ll try to be more aware of these things the next time i’m out. question: does going out to bars/clubs solo, as opposed to a group, really hurt your chances of picking up women? Going out to bars solo isn’t something I’ve ever really been into. The idea isnt just to pick up women, but build a lifestyle thats fulfilling and that you can be proud of. That means reaching out and creating genuine masculine bonds too. Tht means hanging out with people you like. That means going out to have fun. Be careful not to get too sucked into this idea of going out ‘to pick up women’. right, i follow what you’re saying. thanks!